President-elect Barack Obama, in one of the first policy statements of his transition, demanded that the Bush administration either submit the proposed U.S.-Iraq “status-of-forces agreement” to Congress or leave an opening for him to change it next year. Obama’s transition office noted the irony that the Iraqi government was submitting the agreement to its parliament while the Bush administration was set on approving the troop deal on its own authority. Iraqi political leaders are demanding revisions in the current draft of the “status of forces agreement” to firm up a Dec. 31, 2011, withdrawal date for U.S. troops. President George W. Bush wants a departure date that is flexible depending on conditions in Iraq. During the campaign, Obama proposed a 16-month withdrawal timetable, which would have U.S. combat forces out by summer 2010. Obama’s election has had the unexpected effect in Iraq of relieving Iraqi doubts about the commitment of the United States to leave Iraq, according to a report in the New York Times. When Obama launched his presidential campaign 22 months ago, his opposition to the Iraq War and his pledge to withdraw U.S. soldiers as President were cornerstones of his campaign. Although the economic meltdown on Wall Street eclipsed much of the Iraq War debate during the last months of the presidential campaign, Obama and Vice President-elect Joe Biden used the launching of their new transition Web site to reiterate a determination to end the war. More than 4,100 U.S. soldiers and, by some estimates, hundreds of thousands of Iraqis have been killed since Bush invaded Iraq in March 2003. Besides setting a timetable for withdrawing U.S. combat forces from Iraq, Obama still foresees a limited U.S. military presence. “Under the Obama-Biden plan, a residual force will remain in Iraq and in the region to conduct targeted counter-terrorism missions against al-Qaeda in Iraq and to protect American diplomatic and civilian personnel,” his statement read. Bush has been loath to accept a timeline for withdrawal, but he has reportedly agreed to accept a plan that envisions the removal of U.S. troops by the end of 2011. The political debate inside Iraq has been over how to firm up the withdrawal timetable. Obama’s statement recommends a withdrawal pace of one to two combat brigades a month, ending in 16 months. “That would be the summer of 2010 – more than seven years after the war began. 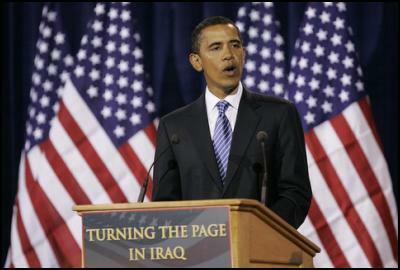 U.S. must apply pressure on the Iraqi government to work toward real political accommodation,” Obama’s plan said. Obama also has proposed dusting off the recommendations from the Iraq Study Group, which was headed by Bush family confidante James Baker and called for engaging Iran and Syria in discussions on stabilizing the region. Since then, more than 1,000 additional U.S. soldiers have died, but Bush and the neocons claim credit for reductions in levels of violence across Iraq. Obama is scheduled to meet with Bush at the White House on Monday and it is likely Obama’s plan for Iraq will come up, according to two members of Obama’s transition team. Last summer, House Speaker Nancy Pelosi and House Majority Leader Steny Hoyer engineered a $162 billion funding bill for Iraq and Afghanistan that funded the war until mid-2009 without a timetable for withdrawing U.S. troops, a move that angered many rank-and-file Democrats. Pelosi apparently did not want to risk a political fight that she thought might jeopardize Democratic seats in Congress or reduce Obama’s chances of winning the White House. At a news conference on Wednesday, Pelosi made scant reference to ending the Iraq War, calling it a “priority” but declining to elaborate. Progressive Democrats and senior members of the Out of Iraq Caucus, including Rep. Maxine Waters and Rep. Lynn Woolsey, are expected to hold up funding for Iraq operations next year unless there are clear benchmarks and timetables for withdrawal attached to spending bills. Veronique de Rugy, a senior research fellow and budget scholar at the Mercatus Center at George Mason University, who has closely tracked spending on the Iraq War, said Congress must change its spending habits. In an interview, de Rugy said the Congress must end its “addiction” to emergency spending, which deprives lawmakers of the routine opportunity to scrutinize how the Pentagon spends the money. Last month, the Congressional Research Service, an investigative arm of Congress, said the Bush administration’s reliance on emergency war funding circumvented normal budget constraints, reduced oversight and created opportunities for slipping in pet projects. Emergency supplemental requests account for nearly all of the $661 billion spent thus far in Iraq and Afghanistan.